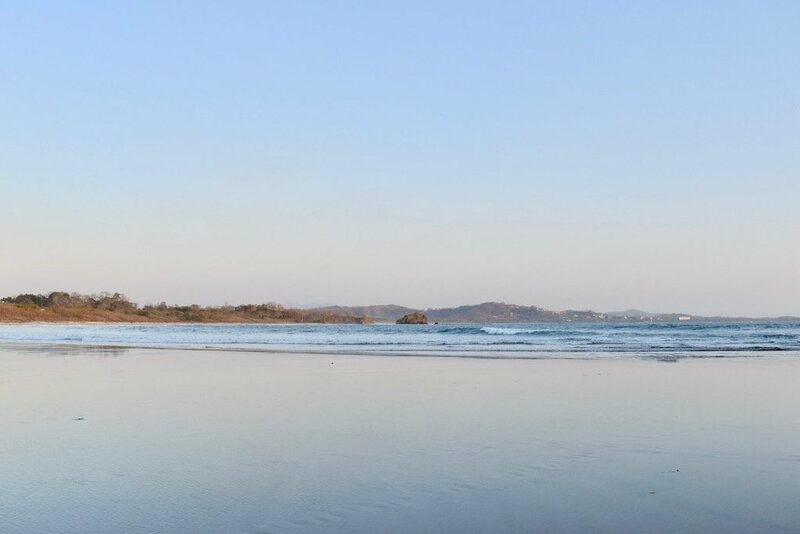 White sand, gold sand, black sand, pink sand, no sand…the beaches on the Nicoya Peninsula will take your breath away. Some are easy to access and populated while others are remote and empty. There are beaches that have waves and others that are perfect for a relaxing soak in the sea. Some of these beaches are even preferred by sea turtles who come to the shores every year to lay their eggs. People come from all around the world come to bask in the sunshine and swim in the warm tropical Pacific Ocean off the coast of the Nicoya Peninsula. The beaches that make up the northern crest of the Nicoya Peninsula are part of Costa Rica’s famous Gold Coast. What’s amazing about the beaches of Costa Rica is that each one is unique. Even ones that are right next to each other can be completely different from one another down to the color of the sand. While you are staying in Playa Grande, here is a week’s worth of beaches to check out. This one is a no brainer! Playa Grande is aptly named. This beach is part of the Las Baulas National Marine Park and once hosted large numbers of nesting leatherback sea turtles. This expansive beach is perfect for long strolls at low tide and surfing at a higher tide. Rip currents are common though, so be careful if you are going out for a swim. Playa Ventanas is the next beach to the north on the other side of the giant rock at the end of Playa Grande. More often than not, you will be the only person on this stretch of sand. Even though it is right around the corner from Playa Grande, it feels like a world away once you turn the corner. Bahia de las Piratas is a bit further north of Playa Ventanas. You can’t walk there though. On the weekends and holidays this is a very popular spot for Costa Rican families; and for good reasons! It’s stunning! There is a large rock in the middle of the bay that is nice for snorkeling around. There are plenty of trees on the north side of the beach, which makes this an ideal spot to set up a picnic and spend the entire day. Playa Minas is a few bays north of Bahia de las Piratas. 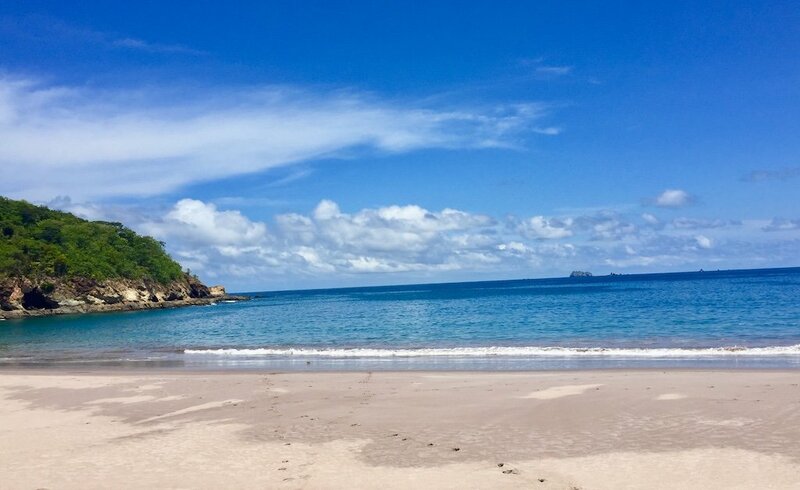 This is another beach that is popular amongst the locals, both Costa Rican and expats. However, if you go early in the morning or during the week, it is likely that few others will be there. This beach is protected in a bay and one of the best swimming beaches around. The water is almost always calm and crystal clear. Crushed up sea shells make up the sand of Playa Conchal, hence the name. This is a truly postcard worthy beach. 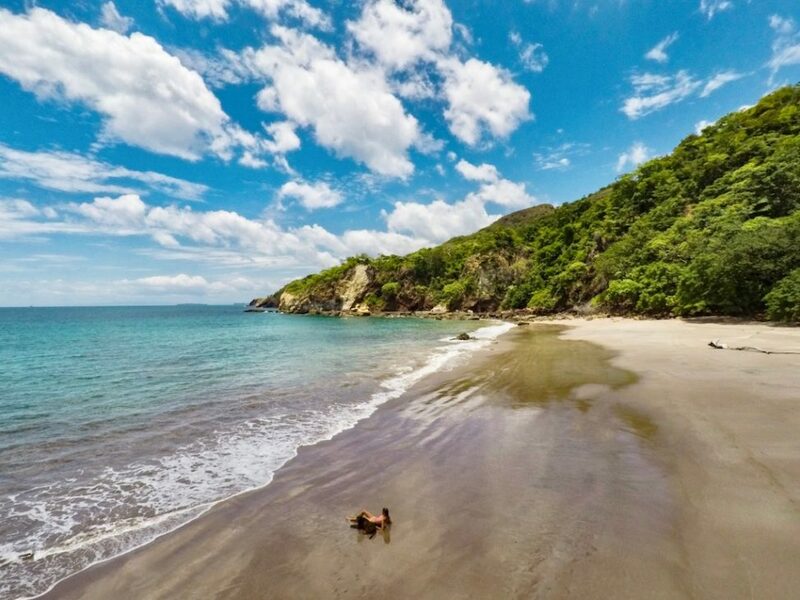 Playa Conchal has been rated as one of Costa Rica’s most beautiful beaches by Lonely Planet and is a perfect place to swim and go snorkeling. About an hour south of Playa Grande is Playa Marbella. 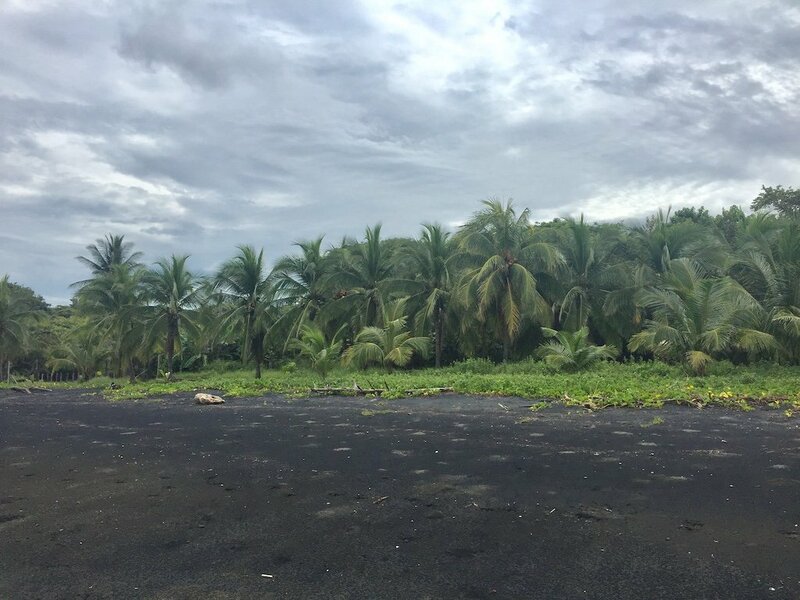 This black-sand and palm tree lined beach is spectacular. This is a great beach to visit if you are looking for a little day adventure. This beach is completely different than any of the above beaches. There is a small restaurant across the street from the beach called the Tiki Hut, but other than that there is nothing. The Tiki Hut is a lovely place to grab lunch and a cold drink. 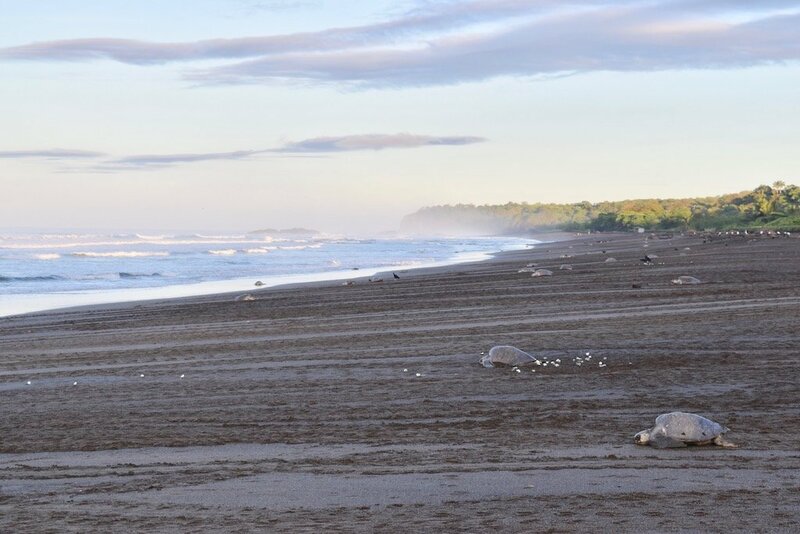 Playa Ostional is world-famous for its Olive Ridley sea turtles. Every month during the rainy seasons thousands to hundreds of thousands of egg-carrying turtles arrive to this gorgeous protected beach to lay their eggs. If you are in Costa Rica during one of these arribadas, you absolutely must make your way down to Ostional to witness this incredible spectacle of nature.